Resist Fascism: a new micro-anthology on Kickstarter! Hi everyone! It's been a long time! We wanted to share with you our new project, which just launched on Kickstarter today! Hidden Youth: ONE HOUR LEFT! The Kickstarter for Hidden Youth ends at 10PM US Eastern time tonight! That's one hour from now! Hidden Youth: Last 48 hours! There are just 48 hours left to the Hidden Youth Kickstarter! Hidden Youth Kickstarter has launched! 3 Weeks to go! The Hidden Youth Kickstarter has launched! We're running a Kickstarter to raise $23,000 so we can publish Hidden Youth, the sequel to Long Hidden! Hidden Youth: Preorders for funding! Plus first look at cover art! Hidden Youth: Speculative Fiction from the Margins of History is now available for preorder! just a quick reminder that today, Friday, July 31, is the last day to send in stories or art portfolios for Hidden Youth! LAST WEEK to submit to Hidden Youth! Hidden Youth Deadline imminent, and World Fantasy! We're extremely pleased and excited to announce that Chesya Burke will join Mikki Kendall as co-editor for Hidden Youth: Speculative Fiction from the Margins of History! Long Hidden 2 is coming! Accessing the Future - 12 days left! we wanted to draw your attention to another crowdfunding project that's very much in line with our goals: Accessing the Future from The Future Fire. Long Hidden contributors win at the Hugos! The Hugo Awards were presented on Sunday night at LonCon3, and two Long Hidden contributors were among the winners! Daniel & Rose at Kickstarter HQ in NYC on Thursday for New Trends in Sci-Fi & Fantasy Fiction panel! Books are on their way! 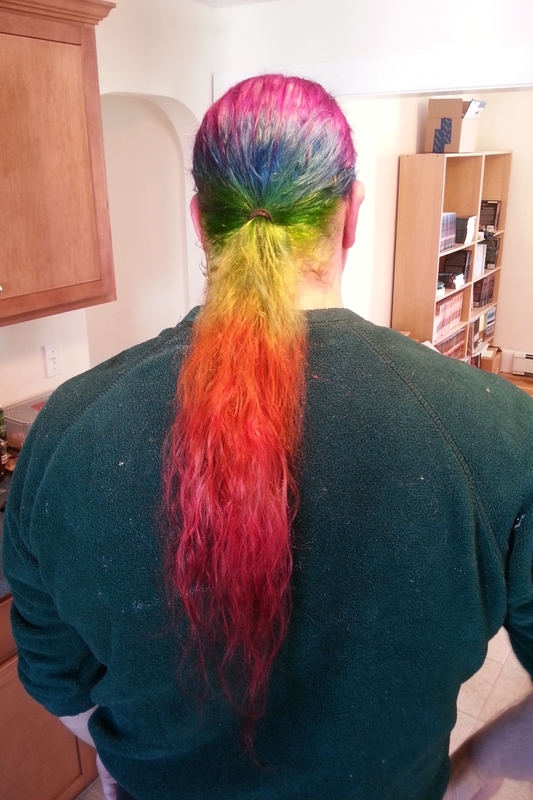 Plus ReaderCon party! We have achieved books! + the SoCal reading/party TOMORROW, & more! Our shipment of books came in today! We just got confirmation that the large printing of Long Hidden books have SHIPPED from the printer! (The second printer, that is.) Woo-hoo! It's time for a status update! There have also been a couple of questions recently that we'd like to address. Mailing addresses! Release party! Packing Party! Long Hidden ebooks! And more! Long Hidden will be released on Friday, May 9! And on Saturday, May 10, there will be a release party in NYC! Remember the Transforming T.A.R.D.I.S.? Here's one more chance! New Kickstarter to support Crossed Genres Magazine! ARC giveaways, NYC release party, packing party & more! Long Hidden Advance Review Copies have arrived! Long Hidden ToC and cover reveal! we've been getting a few questions about the status of submitted stories and art portfolios. Today is the LAST DAY for Long Hidden submissions! Submission deadline EXTENDED! General release in May 2014! Last month to submit to Long Hidden, and more! 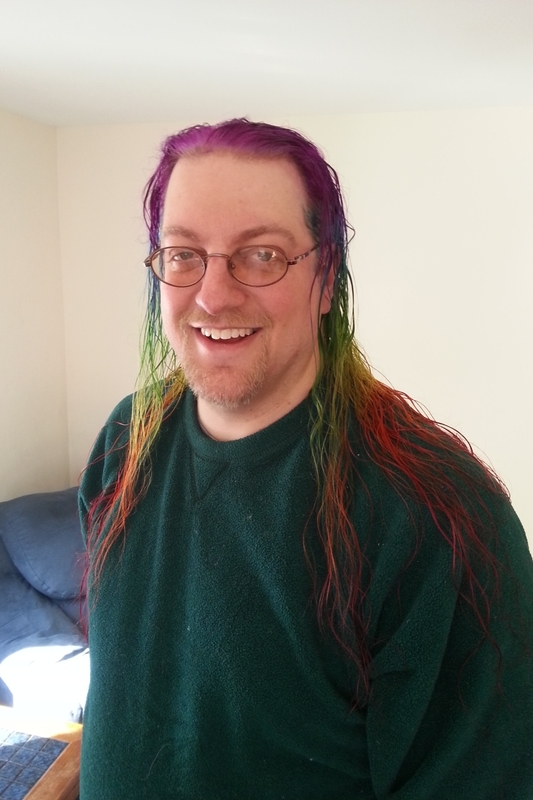 As promised, CG Co-Publisher Bart Leib has gotten his hair dyed rainbow! It's day 9 since the Kickstarter ended and things are progressing well! Backing Long Hidden: It's not too late! The day after: Celebrations! Submissions! This amazing ride is finally drawing to a close. There are less than 60 minutes left to the Long Hidden Kickstarter. We hit $30,000!! Long Hidden will have artwork accompanying every story! Thank you all so much! About 2 hours left - more when we're calmer! Final NEW Reward: Working TARDIS Transformer! 14 hours, plus some motivation... maybe? This is it! We're counting down to 11:59pm, when the Long Hidden Kickstarter will end! ...about 28 hours. That's how much time is left until this incredible ride is over. The Long Hidden Kickstarter has switched from counting down days to counting down hours. We have just 62 hours left! This is it. The final stretch! The Long Hidden Kickstarter has slightly less than one week remaining! It will close to pledges at 11:59pm (EDT) on Sunday, March 31. The road to 1,000 backers: New incentive! Kicking it Forward, and Kickstarter Pals! Stretch goal #2 REACHED! ~50,000 more words! Today (Sat. 3/16) marks the halfway point for the Long Hidden Kickstarter. So how are we doing? Long Hidden was BoingBoing'ed! The popular site posted a feature about the anthology on Saturday evening, and the response was tremendous. Big thanks to Cory Doctorow for posting it! Long Hidden is FUNDED! Now, onward! The anthology is 100% FUNDED! Hi, everyone! This is the first update for the Long Hidden Kickstarter!